Think of it as a kind of screening made possible by the performance of specific movements. A Functional Movement Screen (often referred to as FMS) helps identify asymmetries resulting in functional movement deficiencies. Don’t feel alone – contrary to the initial interpretation by many, no physical screen is involved. Think of it more as screening through the use of a number of simple exercises. FMS helps identify imbalances in stability or mobility while utilizing seven movement patterns (the exercises mentioned above). These motions offer a qualified practitioner an observable assessment of performance in important areas of a patient’s physical body function. When any deficiencies are identified through a Functional Movement Screen, a regimen of exercises is prescribed with the goal of correction and prevention of various injuries, largely musculoskeletal. 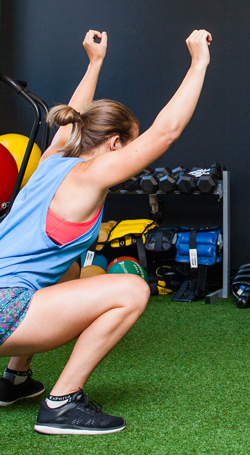 Seven movement patterns are utilized in performing a Functional Movement Screen – all require mobility and stability. But don’t be intimidated – you do not need to be a CrossFitter or body builder to perform these. You’re also not competing with anyone. You’re simply performing these motions to assist in an accurate diagnosis. A Functional Movement Screen is helpful in identifying when a patient is looking at an increased risk of injury. There is documentation of its use in the young and active up to to middle-aged individuals. Elite, collegiate, and professional athletes have all benefited. In addition, first responders and members of the military have utilized it. Again, don’t be intimidated if you aren’t a first responder, Marine, or college athlete. A Functional Movement Screen may be prescribed to give us the best information available for your diagnosis. Many studies have demonstrated the effectiveness of the FMS. Contact us at Dynamic Spine and Sports Therapy for more questions or if you think a Functional Movement Screen might be for you.